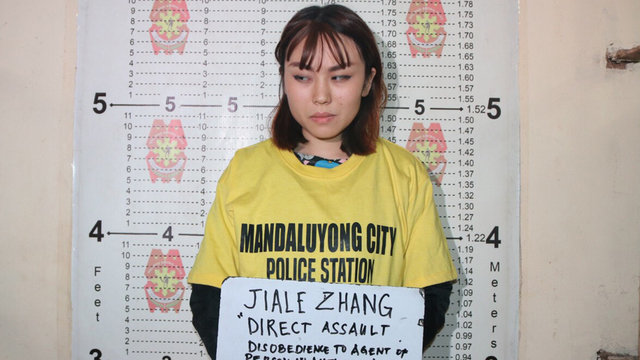 A report by the Mandaluyong police said 23-year-old Chinese national Jiale Zhang was about to board the MRT-3 on Saturday at 8:30 in the morning when Police Officer 1 William Cristobal reminded her of the policy, and asked her to finish her drink first before entering. That’s when Zhang threw her plastic cup of taho at Cristobal. She is now held at the Mandaluyong police headquarters, and facing charges of disobedience to a person in authority and unjust vexation. "It should also be noted that even before the recent ban of bottled water, drinks and liquids, consumption of unsealed food and drinks are prohibited inside trains and stations as this can cause inconvenience, accident and delay to our operations," it added. MRT3 management has recently banned carrying liquid items inside stations because of security considerations. Excluded from the ban are: milk baby formula, drinking water for an infant or small child, medicine, and other liquid needed by a passenger with disability. The policy has received backlash from passengers due to the inconvenience it has caused. MRT management bans liquid as these may be used to create liquid bombs. “The DOTr MRT-3 would like to stress that tighter security measures being implemented inside our trains and stations means no harm to our passengers. We are being cautious since we put in our topmost priorities the safety and security of our passengers and personnel following attacks in Mindanao,” the transport department said. GMT-8, 2019-4-20 14:19, Processed in 0.045008 second(s), 6 queries, Gzip enabled.